Helping the Suicidal Person laminated card When you come into contact with a person who is suicidal, definite intervention is needed. A person's life is at stake, and whether or not you want to be involved, you are! Your initial task is to help the person stay alive. 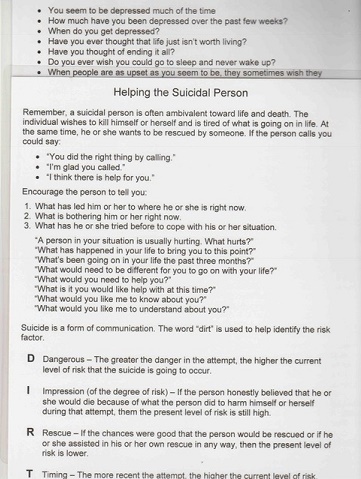 This 8 1/2 x 11 laminated card will help you when you are ministering to a suicidal person as a quick reminder of what to say when speaking to someone who is considering taking their life. This card includes questions to ask and how to respond. Time is of the essence and having this card in reach as a reminder and a tool to help you keep calm at a time of crisis can make a difference in how you face this situation.